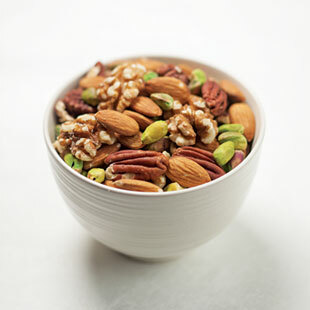 Take Our Poll: What is Your Favorite Nut? Walnuts (185 calories per 14 halves or 1 ounce) are the only nuts that offer a significant amount of the omega-3 fat alpha-linolenic acid (ALA). ALA’s anti-inflammatory properties halt plaque buildup in the arteries that results when “bad” LDL cholesterol is oxidized. The omega-3 is also linked with improved glucose control and stronger bones. In a study of 23 overweight people published in 2007 in Nutrition Journal, increasing intake of ALA via walnuts and flaxseed oil decreased the rate of bone breakdown. A 1-ounce serving (23 nuts, 162 calories) has 37 percent of your daily value for vitamin E—a nutrient many Americans fall short on. You’ll also get calcium, fiber and some folate. A June 2006 study in the Journal of Agricultural and Food Chemistry showed an ounce of almonds provides as many flavonoids—compounds that fight free radicals and reduce inflammation—as a 1/2-cup serving of broccoli or a cup of green tea. Pecans (19 halves, 193 calories per serving) contain more antioxidants—compounds that sweep up tissue-damaging free radicals—than any other tree nut, according to a study in the Journal of Agricultural and Food Chemistry. Pecans also provide notable amounts of zinc, a mineral most often found in animal-based foods. A 1-ounce serving of pistachios—a generous 49 nuts!—has only 157 calories. Pistachios are rich in lutein and zeaxanthin, antioxidants linked with healthy vision.